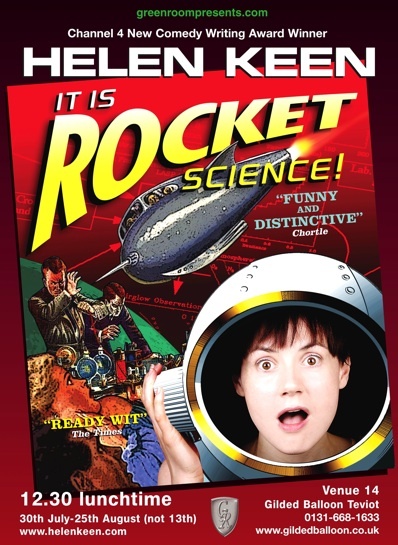 If you’re planning on visiting the Edinburgh Fringe Festival this summer and fancy some light-hearted ‘space-based silliness’, then make sure Helen Keen’s show – It Is Rocket Science – is on your itinerary. Helen Keen is a space-rocket fanatic, and brings her first solo stand-up show It Is Rocket Science to life with a fusion of comedy and a large amount of tinfoil, in a whistlestop tour of the 'Great Brains' who put monkeys, ladies, dogs and gentlemen into orbit. In her own words she describes the show as “space-based silliness” but her material is all based on her life-long passion of the story of rocketry, and accordingly her show is interspersed with personal stories too. Helen started stand-up comedy as an adult, but impressively, only a year after she began to write comedy she won the first Channel 4 New Comedy Writing Award in 2005. Since then she has been nominated for various other awards including Hackney Empire's New Act of the Year, Funny Women and the Leicester Mercury Comedian of the Year. She has also contributed to popular comedy shows on TV and radio, including The Friday Night Project on Channel 4, The Now Show on BBC Radio 4 and BBC Radio 1’s comedy show The Milk Run. She is currently developing programmes with BBC 3 and writing two sitcom pilot scripts for Channel 4. Dana Centre in London on Tuesday 4 November at 7pm.